Forbes Design Center recently completed the re-shingling and window installation of a single family home in Hanover PA! Our clients were in need of a new durable, roof and a new set of windows. Both needed to not only provide ample protection from harsh weather conditions but also amplify the natural beauty of their rancher style family home. After discussing multiple approaches with our clients the Forbes team decided that durability and aesthetics were the number one priority. Using materials that were energy efficient, cost effective and appealing to the eye became our main approach to this project. 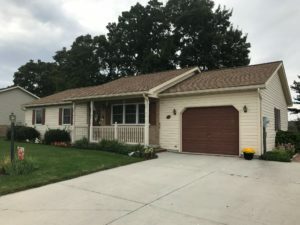 The GAF Weather Stopper Roofing System technology along with Infinity Windows from Marvin were able to provide our client with exactly what they desired. Forbes Design Center provided the best value for a long-term investment. After examining the details of the building, and discussing potential solutions with the clients, our team set to work. Using the Timberline HD® shingles (in shakewood) enabled our team to provide a reliable and cost effective product to compliment the color scheme of the garage and shutters. The Infinity Double Hung Windows provide a durable and energy efficient product that adds an elegant design to the exterior of the home.